Many times while traveling in National Parks I struck up a conversation with a worker. They were either behind a counter or cleaning a campsite. I thirsted for knowledge about how and why they got the jobs they had. What I learned is that many of them were retirees who just wanted to spend time in a beautiful place. Who could argue that? Spend a summer in Yellowstone National Park, or Sequoia, or a winter in the Everglades, why not? I often thought of myself doing the same, but never had the nerve to follow through. Mostly, because my wife Barb wasn’t on the same page as I was. Then after she died, I did embark on a solo journey, but it wasn’t to a national park. I rented a condo in Arizona for two months to grieve. 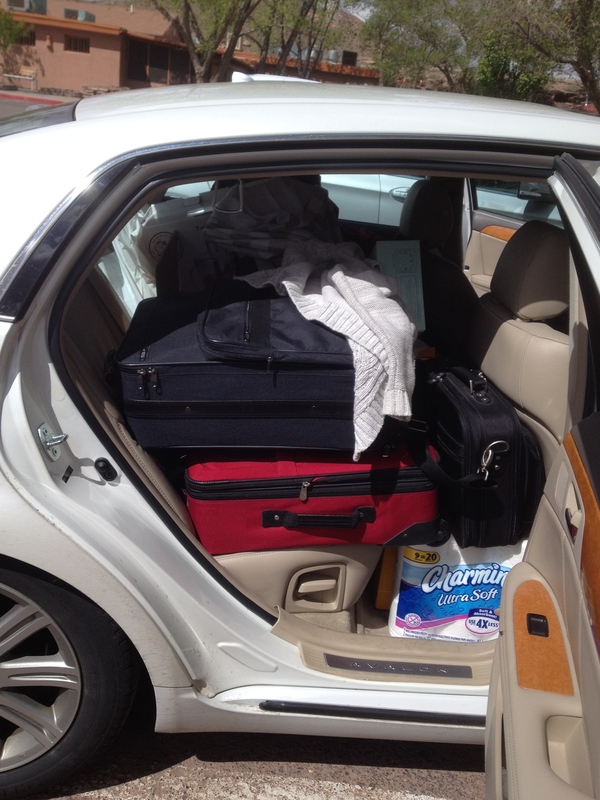 We had often talked of retiring to Arizona, and this was my way of taking her with me to finally do it. Never mind all the excuses I had before, my kids were grown and on their own, I retired from my job, the house could stand a winter without me. What about my friends? Well, except for one young lady, I didn’t have any friends, and she was too young to leave her job to come with me. The telephone would be my link to friends. This week I picked up a book titled Nomadland, it spoke to me, and I loved it. This author chronicled the life I had dreamed of creating for myself. There is a big difference between my way and the way of the people she wrote about. Her people were all sixty somethings who lost jobs, and then homes, and were left without a way to live. In order to survive they managed to learn to live in vans, trailers, motor-homes, tents, or anything that could shelter them from elements because the only jobs they could find didn’t pay enough to rent a room and eat too. Jessica Bruder followed these people for three years, and even joined them in a van of her own to experience what it was like to live in their community. There are thousands of these nomads living this lifestyle because of the independence they get and because they can’t afford anything better. They skip from campground to campground to avoid rent, and take part-time jobs with companies who offer seasonal work just to make gas money and sustenance. 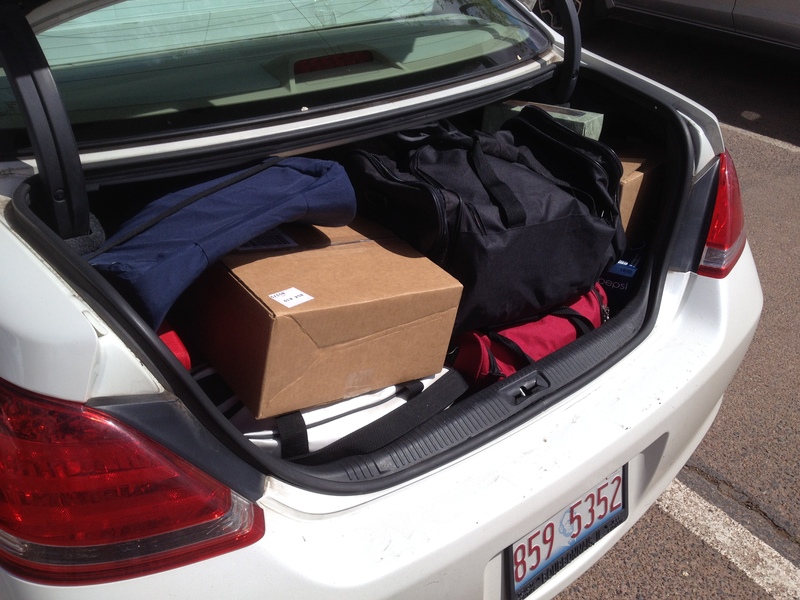 Would you believe that one of the largest employers of part time nomads is Amazon? Yes Amazon, actually recruits workers through their branch called Amazon CamperForce. The stories Bruder relates to working at Amazon Fulfilment Centers are crazy. Can you imagine sixty somethings logging 12-15 miles walking daily inside one of these big box warehouses scanning goods to either put away or to remove for shipping for ten to twelve hours a day? I can’t either, but it is happening right now in a place near you. The people doing it don’t really like it but it allows them to make money to live their lifestyle. Many of them refer to Amazon as the largest slave keeper in the world. I enjoyed reading these stories and following the campers as they moved from city to city to attend events like the Rubber Tramp Rendezvous in the desert near Quartzsite, Arizona. I remember passing through Quartzsite on Inter-state ten on my way to California. It looked like a giant flea market from the road I never wandered off to see if there actually was a city there too, next time I will for sure. If you are into reading books about our American culture and how people cope with life this is a great read. I give it five stars. One of many items on my bucket list is to read the biographies of all the Presidents. So far I have read about twenty. The book I just completed is a piece of the life of Theodore Roosevelt. Imagine living a life so rich in accomplishment that a major adventure fills a book and is just a small part of one’s life. Teddy Roosevelt had just lost the election to become President of the USA for a third term. He tried what is today described as a losing affair. Teddy formed a third-party he called the Bull Moose party to run against Woodrow Wilson a democrat who today is by some considered to be one of the greatest presidents that we ever had. Others, like myself consider him to be the father of American Progressivism, or Socialism. Nevertheless, Roosevelt lost big. In his recovery from the loss, he was talked into making a speaking tour of South America. To make a dull trip more exciting he chose to add an adventure to his itinerary. A friend talked him into an exploration of a little known river in Brazil. The friend imagined the tour to be an easy down river float with all the comforts of home, including chef cooked meals of extraordinary cuisine, and fine wines. Roosevelt’s biggest mistake was to trust the friend to plan and outfit the excursion. While in South America giving speeches, he met a man known for exploring the Brazilian rain forests. The man, Cândido Mariano da Silva Rondon, suggested to Roosevelt that his expedition explore a totally unknown one thousand mile long tributary of the Amazon called the River of Doubt. The adventure would allow Rondon to put this river on the map. The idea appealed to Roosevelt and the whole trip changed in character. Author Candice Millard crafted an extraordinary narrative from details recorded by members of the expedition. The story keeps the reader interested throughout. This story would make an excellent adventure movie, but it is too big to tell, and was made into a series. Teddy on left, Rondon to the right of the post which reads Rio Roosevelt. Rondon renamed the river to honor Roosevelt. Roosevelt’s son Kermit is at the far right. Rondon insisted that each camp they made be named with a marker. 1. I have been in many places, but I’ve never been in Cahoots. Apparently, you can’t go alone. You have to be in Cahoots with someone. 2. I’ve also never been in Cognito. I hear no one recognizes you there. 3. I have, however, been in Sane. They don’t have an airport; you have to be driven there. I have made several trips there, thanks to my children, friends, family and work. 4. I would like to go to Conclusions, but you have to jump, and I’m not too much on physical activity anymore. 5. I have also been in Doubt. That is a sad place to go, and I try not to visit there too often. 6. I’ve been in Flexible, but only when it was very important to stand firm. 7. Sometimes I’m in Capable, and I go there more often as I’m getting older. 8. One of my favorite places to be is in Suspense! It really gets the adrenaline flowing and pumps up the old heart! At my age, I need all the stimuli I can get! A short movie is worth ten thousand words. I have to admit that the word treacherous in the hazardous driving report psyched me out. So much so, that Peg and I spent 24 hours sitting in a hotel room waiting for the snow to melt. 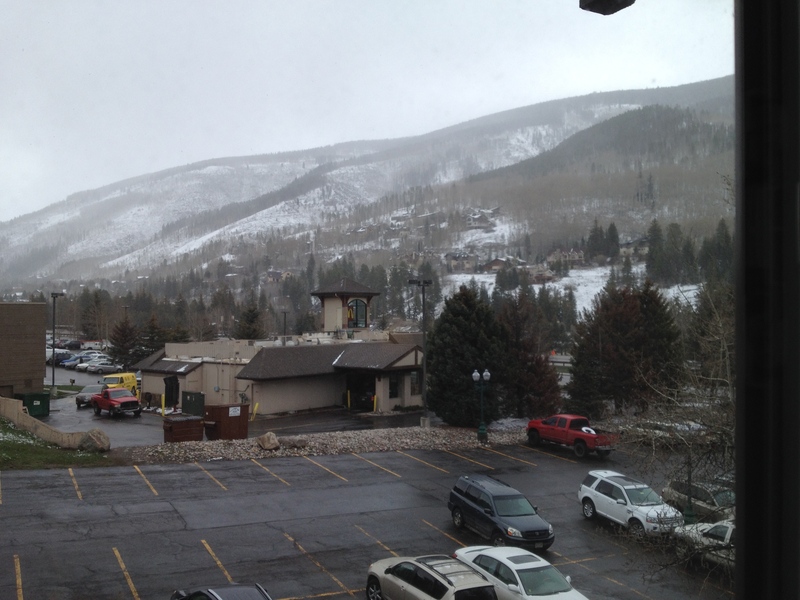 Our window view of Vail, Colorado made up for some of the time. I spent most of the day writing and answering e-mails. The Vail Pass was open on this day, but the day before the State Patrol shagged us off the I-70 because too many accidents had plugged it up. 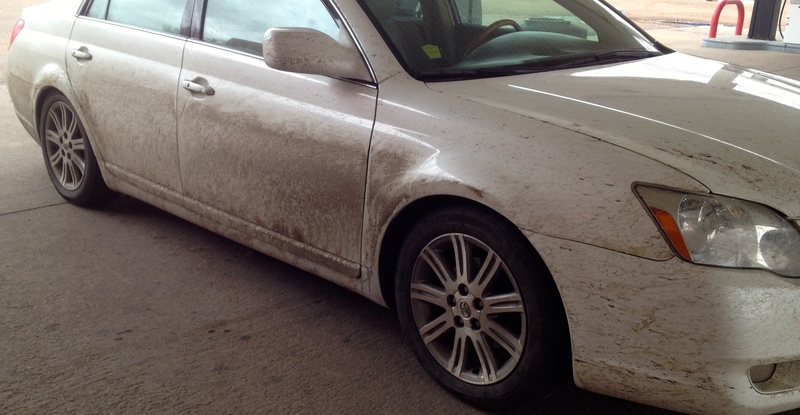 I also spent too much time studying weather reports and driving conditions. 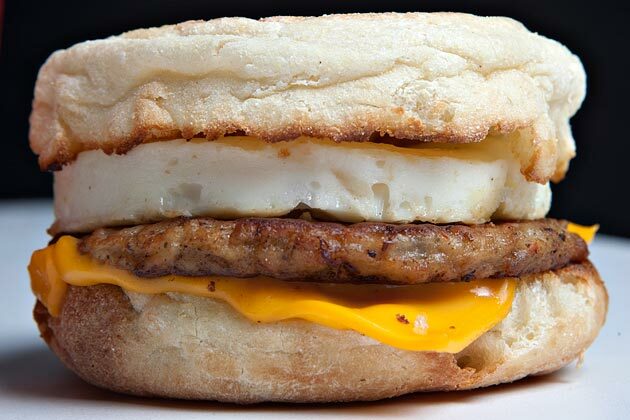 We enjoyed an Egg McMuffin breakfast at the McDonald’s across the parking lot from our hotel. Later in the day we planned to move it up an inch by dining in the hotel restaurant. Since Vail is empty in April, none of the shops were open for us to do the typical touristy walk through the quaint shopping district. This led us back to our room to read, write, and relax. Later we learned that April is out of season and the dining room closes for supper. I inquired and learned of another restaurant immediately next door. We ventured forth. This place was equally deserted and upon entering I had to shout for someone to come from out of the walls. The staff, a man wearing shorts, sweat shirt and a baseball cap with an apron, and a waitress wearing a hooded sweatshirt appeared out of nowhere. The business definitely relied on a big crowd for its heat. Since we were the only ones there to enjoy the cold we left our winter coats on throughout the meal. 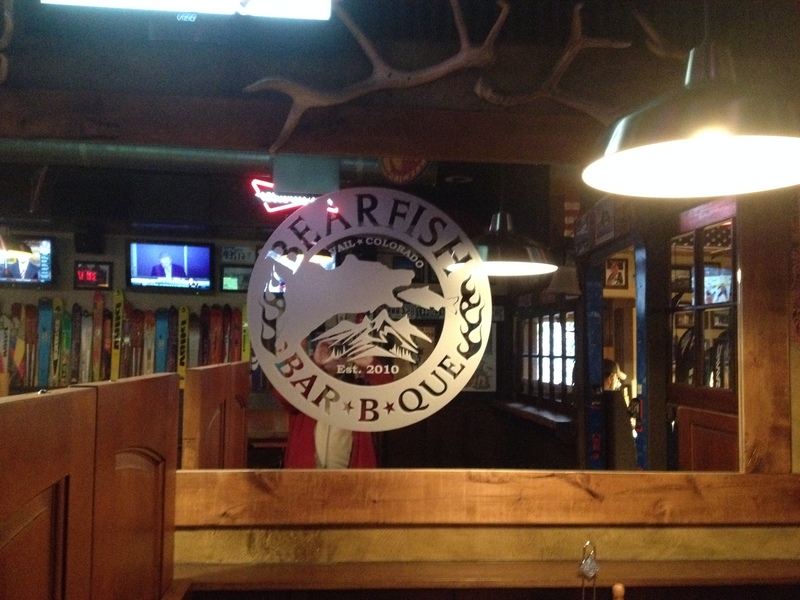 The Bear Fish is by its decor a Sports Bar. 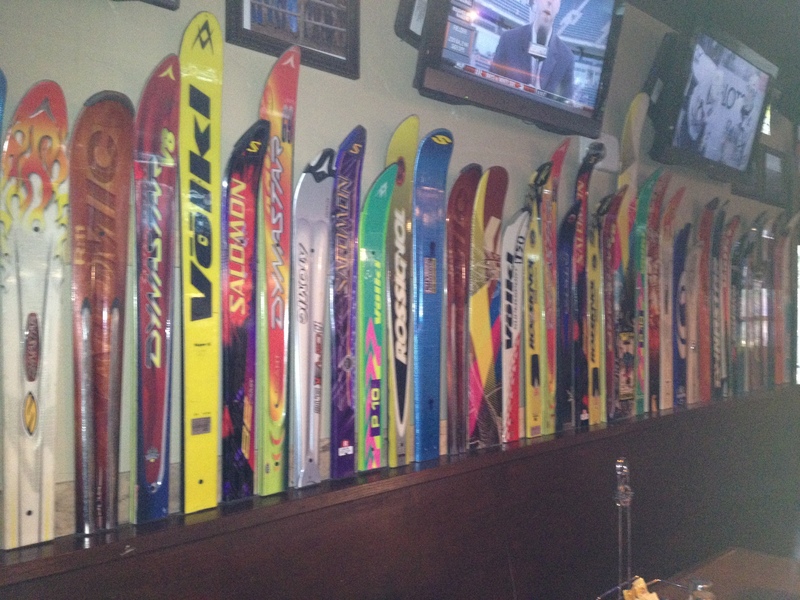 They decorated the walls with skis standing on end. 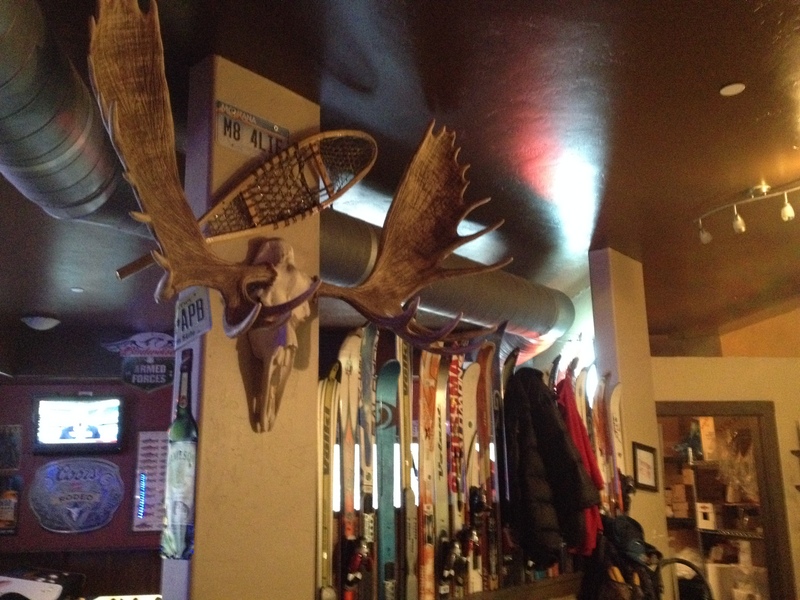 As an extra touch, antlers from a moose adorn one of the side walls. I got the idea that when Bear Fish is in season, and there are people, they are skiers. Genius deduction right? The menu specialized in smoked meats and sea food, mostly sandwiches. I ate a pulled pork sandwich with crispy sweet potato fries washed down with a Cabernet. Peg munched on a green salad finished off with a hamburger, and lemonade. We left totally sated and to our surprise several other people had ventured in and were eating in the main dining area. All of them kept their winter coats on. The following morning, we awoke to two inches of new snow covering everything, including the Death Star. We could barely make out the white car covered in white, and parked on a totally white parking lot. We ate breakfast in the hotel restaurant. It is a quaint place with good food. The crowd in the room led us to believe we were not the only ones at the hotel as we wanted to believe. Many people did what we did, i.e. sit out a day of the bad weather. By the time we loaded the Death Star with our overnight stuff and gassed up it was ten-thirty. I nervously drove through the town of Vail which is a canyon of ski chalets, lodges, resorts, condos, and tall buildings running up the side of the mountain, and merged the I-70. Vail is 8500 feet high, and the roads were dry. As we drove east the road began to ascend the Vail Pass and snow flurries began to swirl around us as we drove at fifty mph up the hill. I read that the pass is 10,500 feet high, so we had a climb ahead. We passed some parked snow plows, and I thought that is comforting to know that they do plow the roads. Further along we saw semi-trucks pulled off to the side with drivers attaching chains to their driving wheels. We reached the level of two slushy lanes with somewhat cleaner tire tracks in each. I switched the GPS to show elevation, and surprisingly we were nearly at ten thousand feet. My white knuckles hurt from clenching the wheel so tight, and the right hand fingers kept pulling the washer lever to spritz the windshield clear. By now our speed was more like thirty mph, and some brave SUV’s passed spraying our windows with slush. I turned on the emergency blinkers to show that I was a slow-moving vehicle, but there weren’t too many cars passing me. We reached the tunnel, and I thought this is it, we reached the peak. Wrong again. The damn tunnel climbed and we kept on climbing to over eleven thousand feet. “We are two miles high,” I told Peg. The snow kept blowing, the road narrowed to one passable lane and the windows kept getting dirty by passing cars. I finally passed a truck going fifteen mph, and he sprayed me with a stream of slush that moved us sideways. Just at that moment my cell phone rang. What the? “Sorry phone, but I am not answering you now,” I said out loud. My phone rings once a month and it happens now. I didn’t even look at it to see who called. No way was I taking my eyes or hands off this wheel for anything. We finally crossed the Vail Pass and descended to nine thousand feet when we reached the Loveland Pass which is higher than the Vail. We went through the same white knuckle experience except this pass is higher than the Vail topping out at 11,990 feet. The descent couldn’t come quick enough for me. It finally did and we dropped down to eight thousand feet where the roads were dry and traffic resumed to sixty-five miles per hour. It was like nothing had happened at this lower level, but a raging blizzard was happening just a few feet above us. A couple of hundred miles east of Denver I stopped for gas and couldn’t believe my eyes. 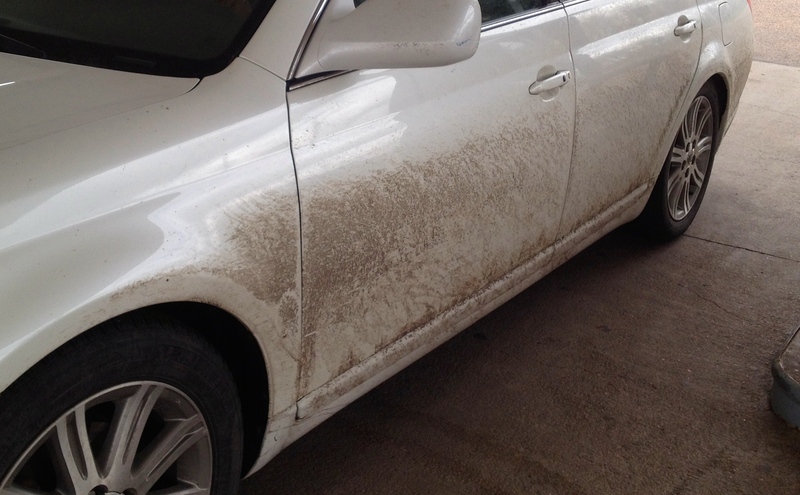 The sides of my car were black with slushy road dirt. My beautiful Blizzard White Death Star had earned its badge-of-honor crossing two mountains in a raging spring snow storm. Our plan was to tour Canyon de Chelly (pronounced canyon de shay) National Park today, but the weather did not coöperate and we left Chinle for Denver. The route took us north through Moab, UT. The Indian reservations between Chinle, and Moab cover some absolutely stunning scenery. Giant monoliths, painted deserts, miles of sandy desert filled with sage, tumble weed, and creosote shrubs. We unexpectedly lost an hour today because this little section of Arizona is on Daylight Savings Time. That put me back an hour of drive time, and I deliberately avoided taking too many rest and gas stops. Along the road between Chinle, Arizona and Moab, Utah. 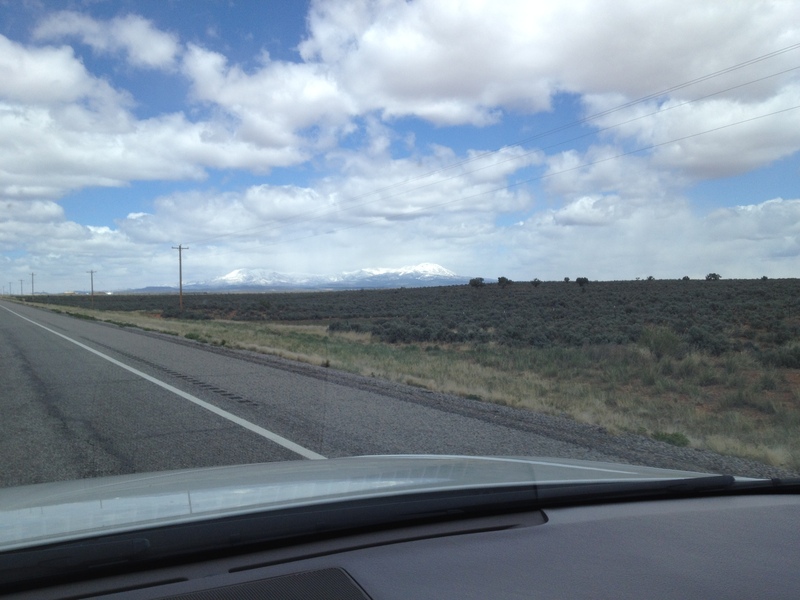 Snow-capped mountains provide the backdrop for a sage filled desert. Taken from inside a car doing seventy mph with an iPhone held up to the windscreen. The drive was relatively uneventful for the first hour then out of nowhere a rusty colored dog appeared in the middle of the road within feet of my bumper. I heard Peggy gasp, and I automatically lifted my foot from the accelerator and began applying brakes. Luckily the wiry dog that blended into the landscape decided to trot off into the desert opposite his home. About ten minutes later I saw what appeared to me a group of large sage bushes along side of the road. These were not sage but a herd of very wooly sheep grazing on the roadside outside their pasture fence. I asked Peg if she had seen any signs to warn of animals ahead, she had not. About five miles further, a cowboy on a horse was moving a large herd of goats along the roadside, most likely to a new pasture. Evidently, Sunday morning is when the animals move, get moved, or feel safe grazing on the edge of the road. Our average speed for the first two and a half hours was sixty-five miles per hour. Not bad for slow two lane roads with traffic, animals and great scenery. 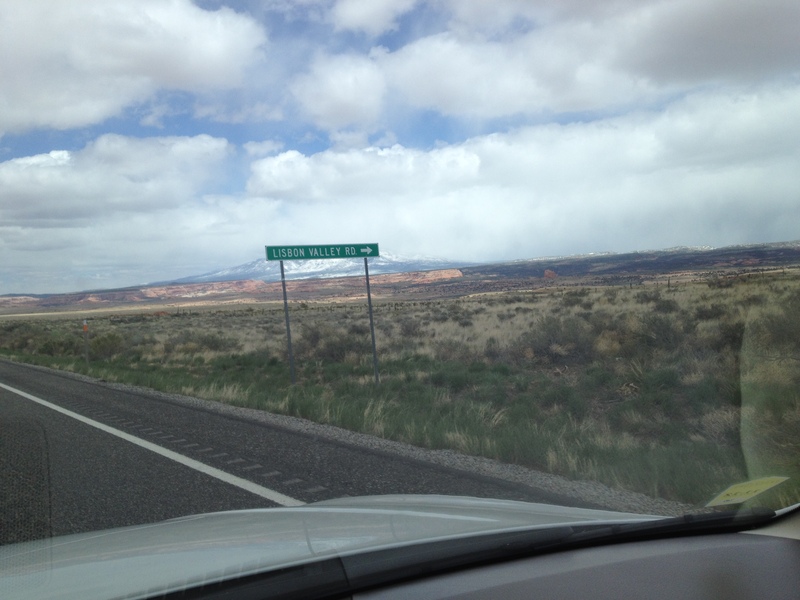 We gassed up in Moab, and left town headed to Interstate Seventy (I-70). The GPS calculated an 8:00 p.m. arrival time in Wheat Ridge, Colorado where I had reservations at a Holiday Inn Express. We favor this chain because of the travel convenience they offer. They are newer, there are many of them, and we get a buffet breakfast. Not having to find a café, wait for a waitress, read a menu, get the food, eat, and then pay the bill adds at least an extra hour to our drive day. We reached the I-70 and I breathed easier driving on a beautiful two lane limited access road with a seventy-five mph speed limit. I pushed the Death Star up to seventy-five and set the cruise control and watched the scenery roll by. I spotted an electronic sign with a message, “I-70 Closed, MM 176.” Hmmm, I wondered what that meant, highway-repair work, snow, what? Surely if it is road work they will split the traffic and route us to a single lane, but why would they close the road if they do that. They could detour us to a local road. yes, that’s it we will detour. Forty minutes later we learned the highway patrol closed the I-70 at Mile Marker 176 in Vail Colorado at the western end of the Vail Pass. There was no detour, there were hundreds of cars trucks, and Rv’s, parked along the local roads heading back into Vail. We drove through the town passing dozens of huge resort condos, hotels, lodges, and motels. All of them looked absolutely deserted and empty. 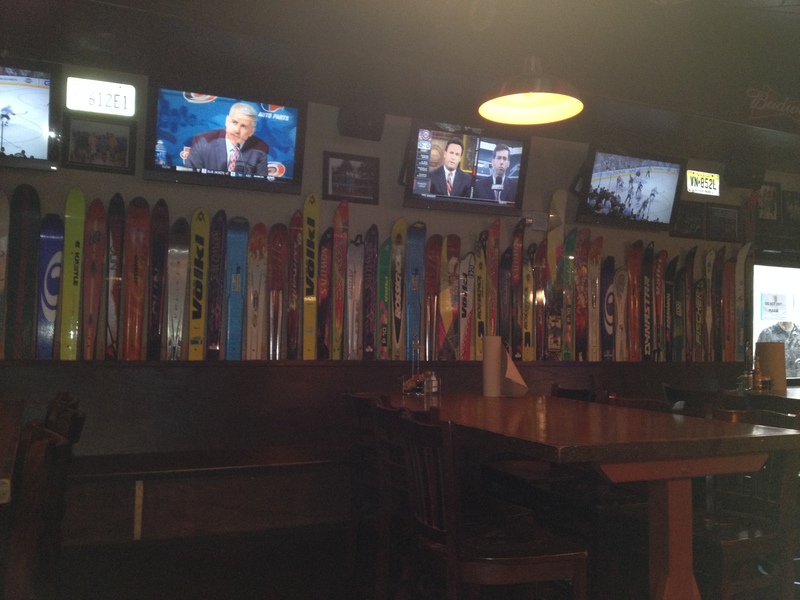 I queried the GPS for lodging and came up with a Holiday Inn at the West end of Vail. Luckily, they had availability so we checked in. In the morning Peggy and I will find a sport shop and rent snow boards for a little fun on the snow-covered slopes above Vail. We learned that the I-70 closed because of a wreck in the pass. It never dawned on me that an accident could shut the road down. It makes sense to keep traffic out of a narrow limited access road to allow Emergency vehicles, wreckers, and police to get to the scene. I called the Holiday Inn Express to cancel the reservation I made for this evening. We are exactly ninety-miles from that destination. Oh well, it adds another ninety miles to tomorrow’s drive. There are two days I abhor and hate to the point of murder. They are the day I pack to leave on a trip, and the day I pack to return from the same trip. I think one of us has to focus on taking less stuff and buying less stuff.